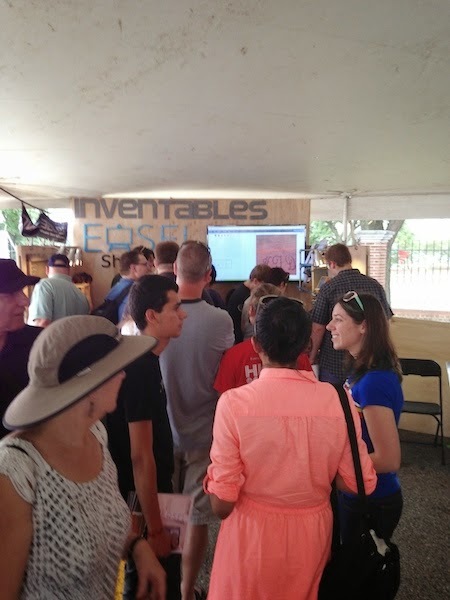 This weekend the Inventables Team hit the road and drove from our headquarters in Chicago to the Motor City for the 2014 edition of Maker Faire Detroit. After about a 5 hour drive me finally made it. 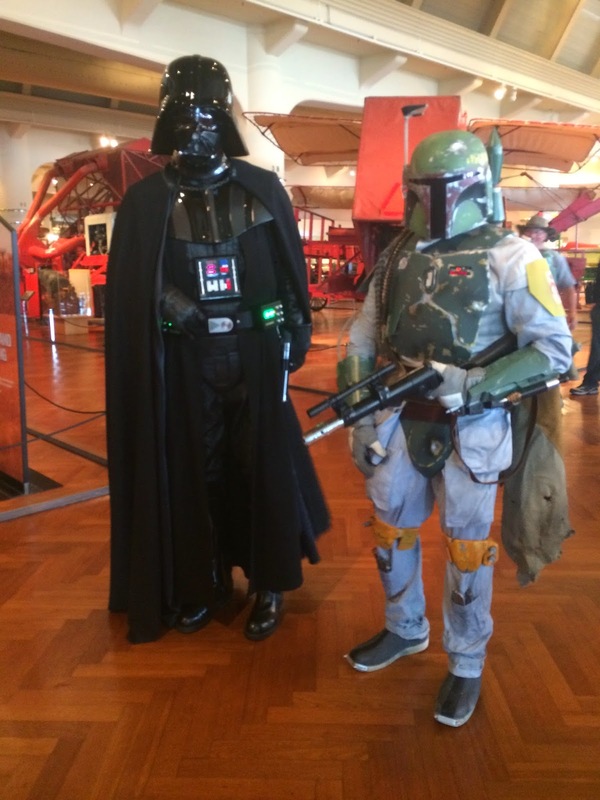 The Faire is hosted by The Henry Ford Museum. The mission of the Henry Ford is to provide unique educational experiences based on authentic objects, stories, and lives from America's traditions of ingenuity, resourcefulness and innovation. Their purpose is to inspire people to learn from these traditions to help shape a better future. 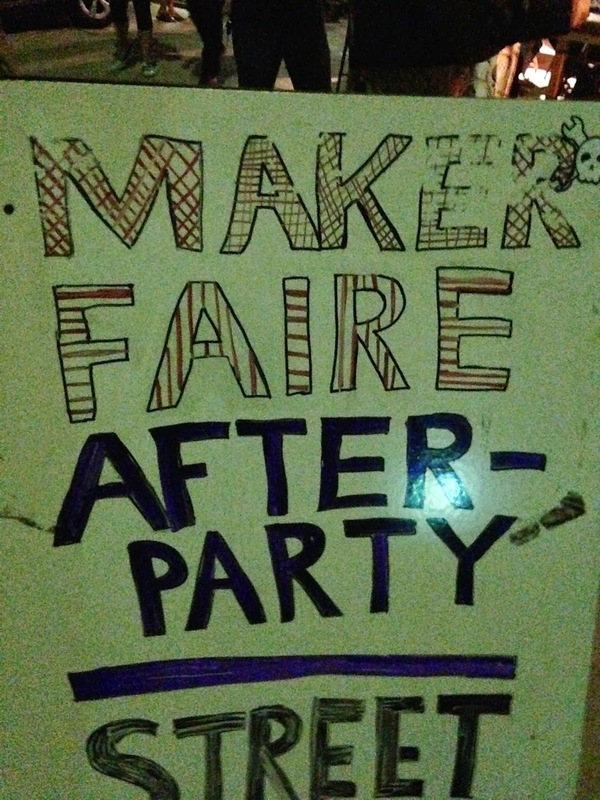 That's what it makes it a perfect venue for Maker Faire. In addition to having a huge parking lot out front they have an incredible number of artifacts that you might call a piece of "Americana". 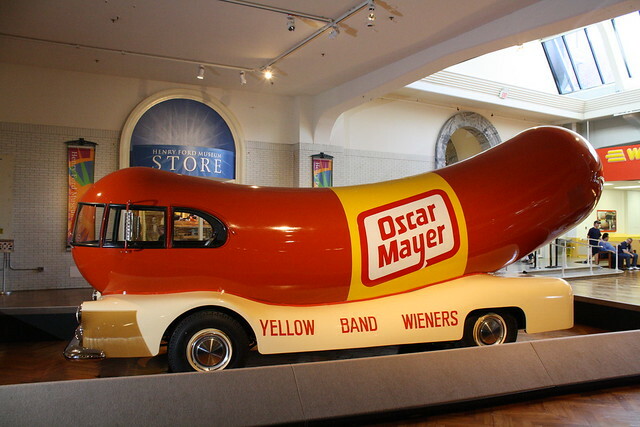 For example one of the original Oscar Mayer Wiener Mobiles below. 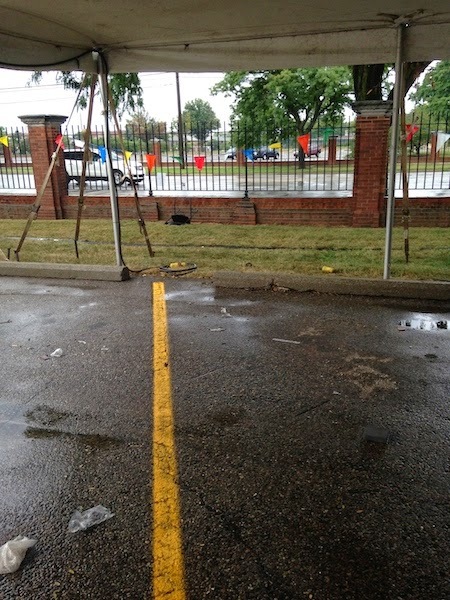 When we got there we were assigned to this spot in a big tent with a bunch of other Makers. We turned this empty parking spot into a booth that showcased our new Easel software and the Shapeoko 2 3D Carving Machine. After a few hours of set up we got things looking pretty good. On the left side you see the display cases featuring some products that are made using 3D Carving (CNC Milling) including eyeglasses by Drift Eyewear, EXOvault iPhone case by sculptors Jonathan Schipper and Amelia Biewald, and a Premium Pour-Over Brewer designed by Darin Montgomery of Urbancase. Inventables employees John McWhirter and Sam Aliamo are getting the Shapeoko 2 set up so guests that come visit us can make their own bottle opener. After everything got set up we went over to Omni Corp Detroit. 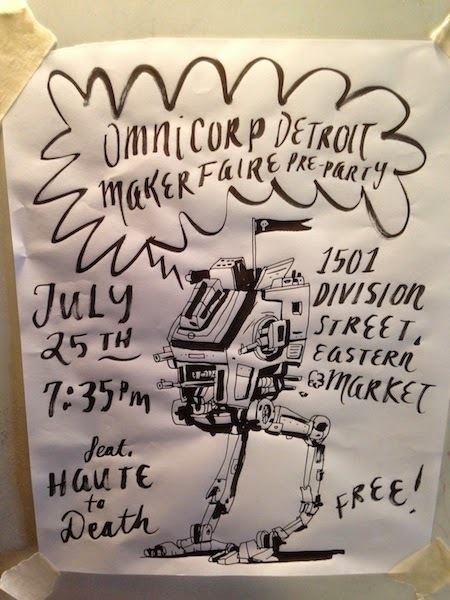 They are a hackerspace that has makers / entrepreneurs / doers / thinkers / creators / artists / designers / engineers / musicians and others who come together in a repurposed industrial building in Eastern Market to work on projects, learn and share together. They’ve been around since 2009. They had a "pre-party"to get the Maker Faire weekend kicked off right. It was one of the cleaner hackerspaces we've been to. 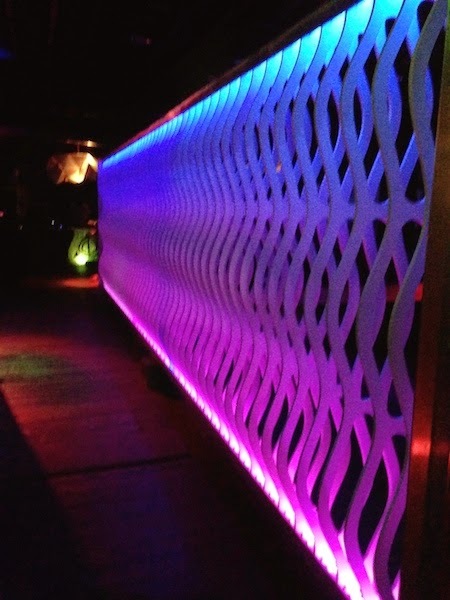 They had a really cool LED sculpture that changed colors. It set a cool vibe for the party. We also got to see their monster laser cutter in action. It was cutting out some leave shaped decorations out of felt for an upcoming wedding. The music was pumping the beer was flowing and makers were talking shop and giving tours. After a few hours we took off to get some sleep because we had to get to Maker Faire bright and early. Saturday morning our first order of business was to test out the electric go kart we have been working on for the Power Racing Series. 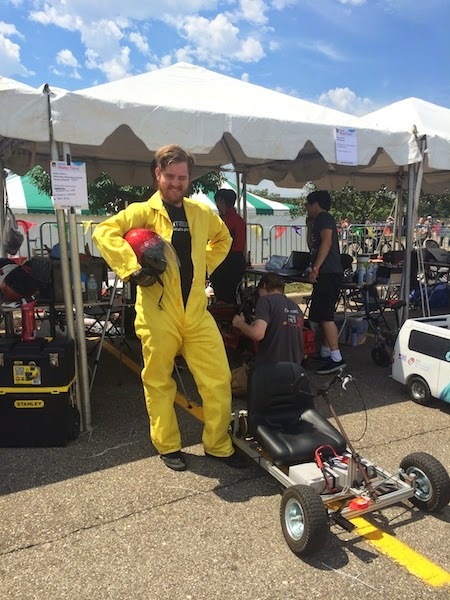 You can see Inventables employee John Hayes standing next to the kart in his Yellow racing suit. The kart is unique because it can be assembled with hand tools. This means no welding or special shop equipment is required. We've been working on it as an open source platform to get high school students into the sport. Our intern Jeremy Bloyd-Peshkin has been very active in the Power Racing Series and spent the semester at our office working on it. We tested it out at San Mateo, Kansas City, and this weekend Detroit. The best way to test out a car is to race it. We got 21 seconds in the time trial which was on the slow side. The fastest cars got about 15 seconds. This was actually quite exciting because we've designed the car as a platform that other teams can use to improve it. The kit is meant to prompt lots of opportunity for learning and innovation. The turns put a lot of force on the steering column and it became a bit loose after the speed race. We're probably going to have to redesign that part of the car. Also we need to fix the camber on the front wheels. Maker Faire engages and inspires people of all ages at all different levels. With the Power Racing Series you can get involved on a team that designs and builds a $500 electric race car. If you come to the fair you can watch the race and cheer on your favorite teams. Walking around the other parts of the fair we bumped into some costume makers that were dressed as Darth Vader and Storm Troopers from the Star Wars movies. The quality of the costumes they had made as absolutely incredible. Below the storm troopers were taking some photos and a cupcake drove by from ACME Muffineering. As we walked further down the midway we came across some folks that had built a skee ball game with a twist...it was on fire! The inventors of this exhibit asked: "What could possibly be better than Skee Ball?" They came up with fire-erupting Skee Ball! Lovingly dubbed Riskee Ball, this reimagined arcade staple will blast fire from the central row of target holes and straight out the top when some serious celebrating is in order. Topped with rotating warning lights and air horns to signal special game modes, like sudden death eruption mode where points scored on one machine triggers flames on them all, this bank of ten modular machines are the perfect addition to any pyromaniac’s arcade. 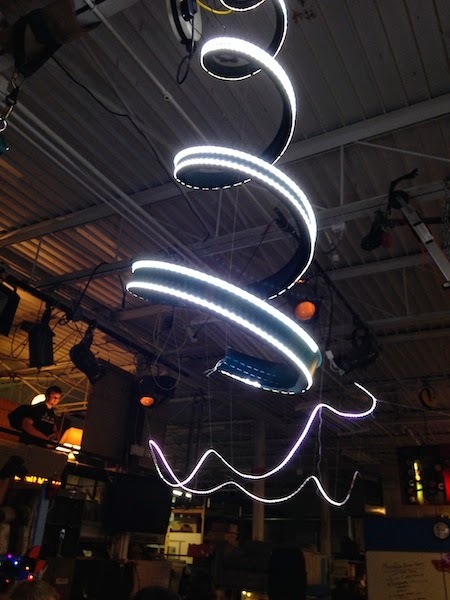 This first appeared at Burning Man in 2013. Then as we ventured inside we caught up with John Oly from See Me CNC. 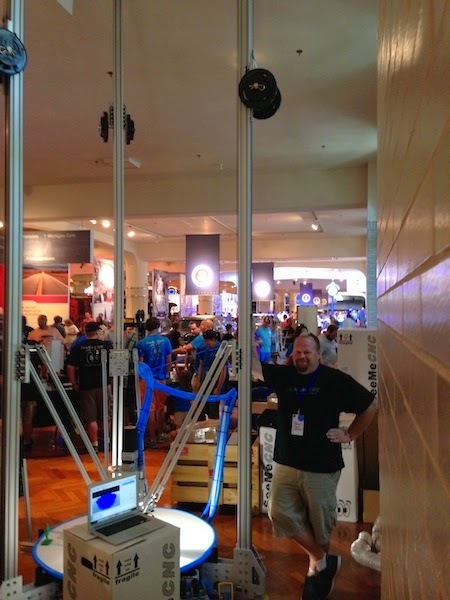 Normally they bring out their delta style 3D printers out to the Maker Faires but this time they upped the ante. They decided to go big and made a 15 foot tall 3D printer! The picture below shows John standing next to the printer for some perspective. Their booth was packed with people learning about their machines and taking pictures of what probably the biggest 3D printer in the world. John told me they put their whole company on the project for about two weeks and they had just finished putting it together right before I walked up. It was a very impressive feat. They called the machine "The Part Daddy". The extruder featured a swappable nozzle with diameters of 6.35 or 7.25mm. The max size part they expect the machine to make is 10 feet high with a diameter of approximately 4 feet. The nozzles are much larger than desktop models so print speeds can be faster. During the day Saturday Curt Catallo owner of the Vinsetta Garage came by to check out Easel and Shapeoko. He quickly became a fan and said that he wanted to make some things for the restaurant. He was pretty excited about the possibilities and invited us to be his guest Saturday night. 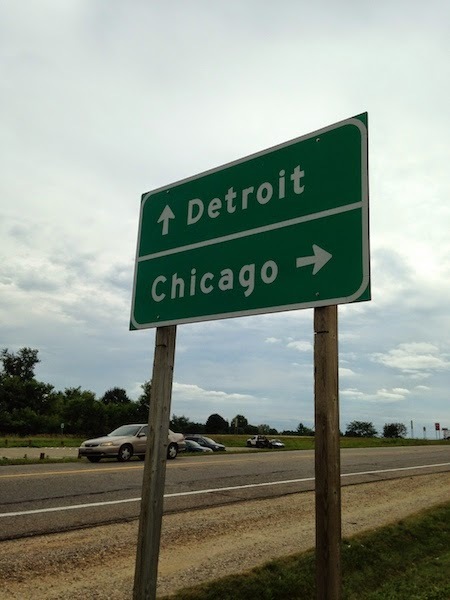 It's the kind of place that made a name for itself on Woodward Avenue by delivering the deepest kind of care to car owners and auto lovers one wrench turn at a time. Today, the oldest garage east of the Mississippi carries a different kind of torch but the cause remains the same: make it honest, make it legit and make it as good as you know how. While the Kurta and Marwil families have long since moved their tools out of the station, the tradition they set still steers the joint one course at a time. Chef Aaron Cozadd's menu is built on the kind of custom Detroit eats that the mechanics and techs would have called their own back in the day. With burgers, Union Mac & Cheese, noodle bowls, coal-fired pies and the like: the new crew is working to keep the legend of Vinsetta Garage alive on Woodward Avenue and beyond. We had an unbelievable meal and the craft beer selection was top notch! Huge thanks to Curt and his team. We'll have to hit him back with some Inventables love. 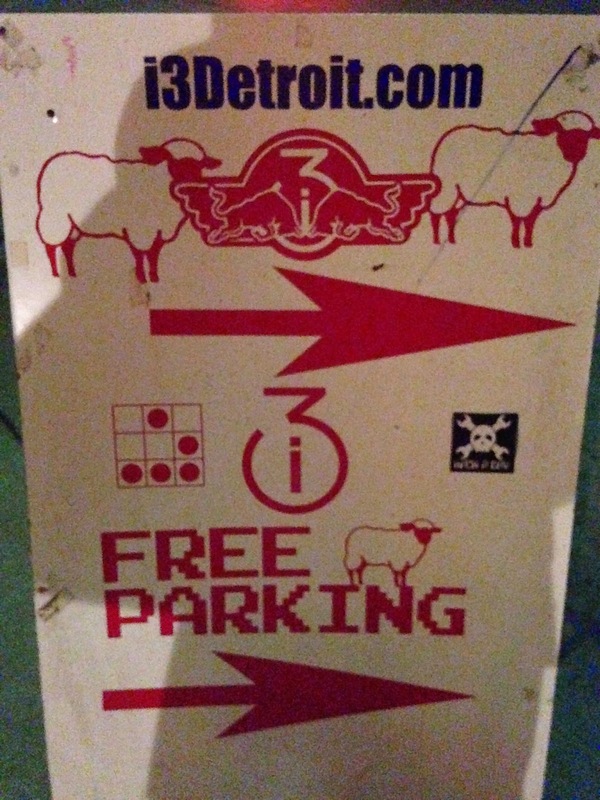 After dinner we headed over to I3 Detroit. It is Metro Detroit's largest community run DIY Workshop. For $49 a month you get a key and access to a boat load of cool tools, machines, and toys. Back at Maker Faire Day two we had a HUGE line. 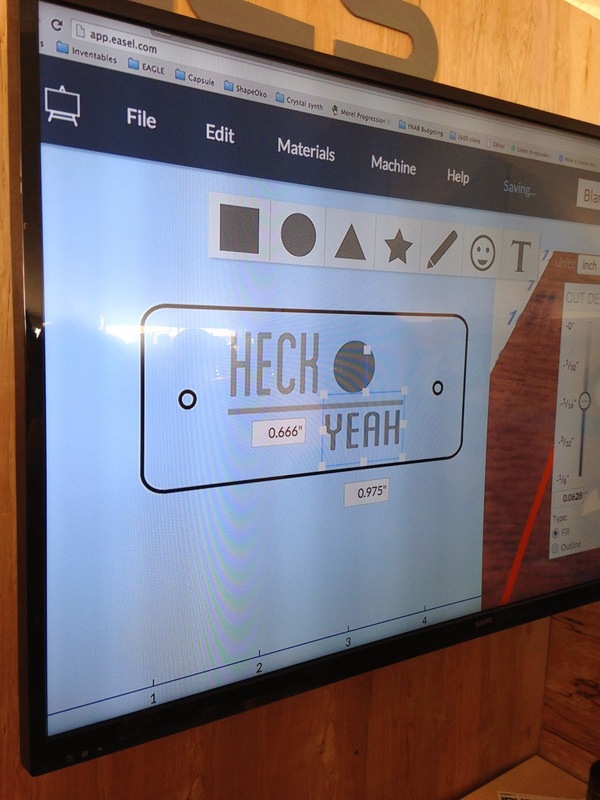 The excitement was building as word started getting out that you could manufacture your own bottle opener at our booth. In addition we raffled off a free Shapeoko 3D Carver. That just about doubled our line. We got kids of all ages that came to try that hand at Easel. While the machines were running kids that wanted to get close had to put on a pair of safety glasses. Easel is designed to help you go from idea to finished product for the first time in less than 5 minutes. We get very excited when we see little kids walk up to Easel and create a design. It demonstrates that our user experience doesn't require an engineering background or any training. However we have noticed that young kids are sometimes better with the computer than their parents! In the midst of all the madness there was a maker celebrity sighting. 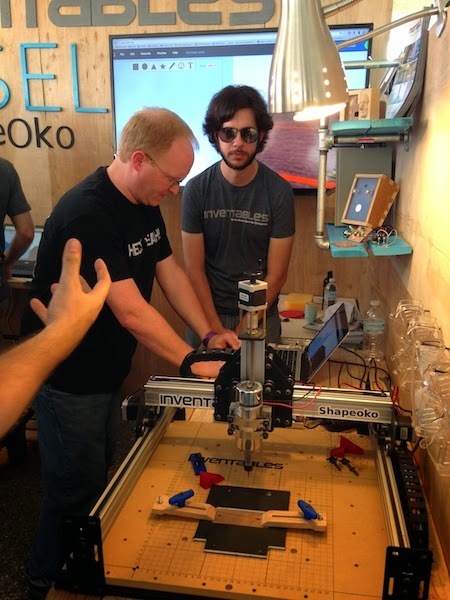 It seemed like Ben Heck from the Ben Heck Show had wandered over to check out Inventables, Easel and the Shapeoko 2. 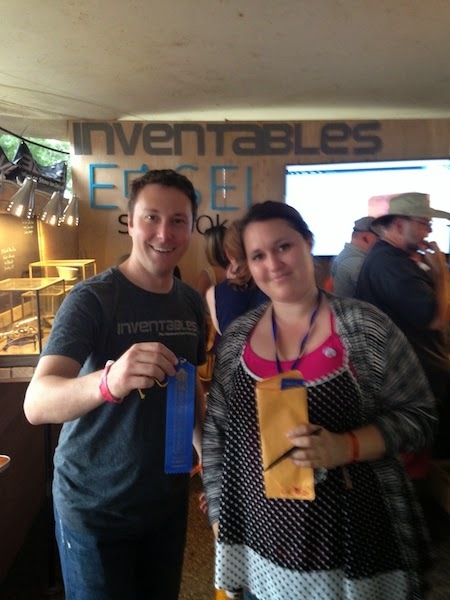 The T-shirt gave us a sneaking suspicion that we might be in the midst of greatness so we immediately called Inventables security to make sure Mr. Heck was protected while he designed his bottle opener. Ben is best known as a console modder. He takes apart old video game consoles such as the Atari 2600 and Nintendo Entertainment System and reconfigures internal printed circuit board (PCB) into a smaller form factor. The newly configured circuit board is enclosed within a custom case with his Shopbot. Let's put it this way...the guy is awesome. We had a good bit of fun with him as he worked on his design for the bottle opener. Ben was telling us some stories about the pin ball machine projects he's been working on. It seems like Pin Ball is making a comeback especially in the DIY community. People have spent so much time playing "Screen" games there is a movement to games that are more physical. This time around with Pin Ball makers are able to mod and make the games like never before. We talked about Williams and Game Plan. Ben even has a YouTube video where he shows you how to make your own Pinball Machine! In the video Ben gives an overview of what it takes to build a pinball game and goes into detail on the electronic aspects on his Ghost Squad pinball game. Then after he finished he was nice enough to take a picture. Heck Yeah! Right as we were packing up a representative from Maker Faire came and gave our booth the editor's choice award. This was totally unexpected and totally exciting. It's the second time we've won this award. We also won at Maker Faire San Mateo. She said she really liked how the booth looked good but also gave guests a hands on activity to get them engaged. Then we packed it all up in the truck and headed back to Chicago. Below is a shot of our team right before we hit the road. 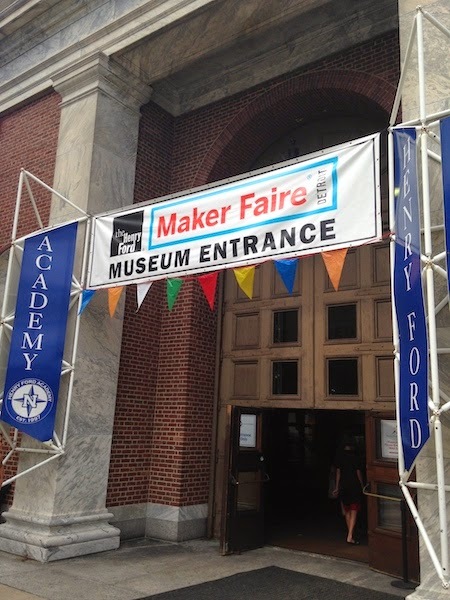 See you next time at Maker Faire New York!